ï»¿ Celebrate Community Service on Your Campus! The Connecticut Commission on Community Service and Office of Higher Education have recognized six students, student groups and faculty and staff with 2014 Higher Education Community Service Awards. The honorees were announced at a celebratory dinner on April 8, 2014 at Central CT State University. They were selected from 103 nominations based on the extent to which their service projects address community needs, incorporate unique approaches, and raise student participation. The 2014 awards recipients are listed below. 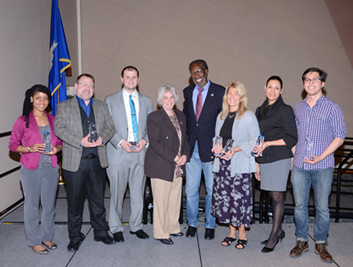 2014 award recipients with William R. Dyson, Commission chair, and Jane A. Ciarleglio, Office of Higher Education Executive Director. Miranda Polaski of Post University has worked to bring about sustainable and environmental change on campus. award for Miranda Polaski. Nordia Meggie of the University of Connecticut created â€œPipeline Connect,â€� a college mentoring project for Hartford youngsters. Beta Mu Sigma Fraternity of Southern CT State University organized a formal dance, among other activities, for CT Special Olympics athletes. Rob Marona of Beta Mu Sigma Fraternity accepts award. JELLO (January Experience of Living, Learning & Outreach) of Trinity College is a year-long initiative that works with several community groups. Edgar Soto accepts award on behalf of JELLO. Hannah Hurwitz of Central CT State University directs "Community Central" which provides a wealth of opportunities for student volunteers. Jessica Hernandez accepts award for Hannah Hurwitz. Stacy Christensen and Jill Espelin of Central CT State University are nursing professors who founded a health clinic in downtown New Britain. Stacy Christensen accepts award for herself and Jill Espelin.